Life was certainly different in 1903 when this film was taken. 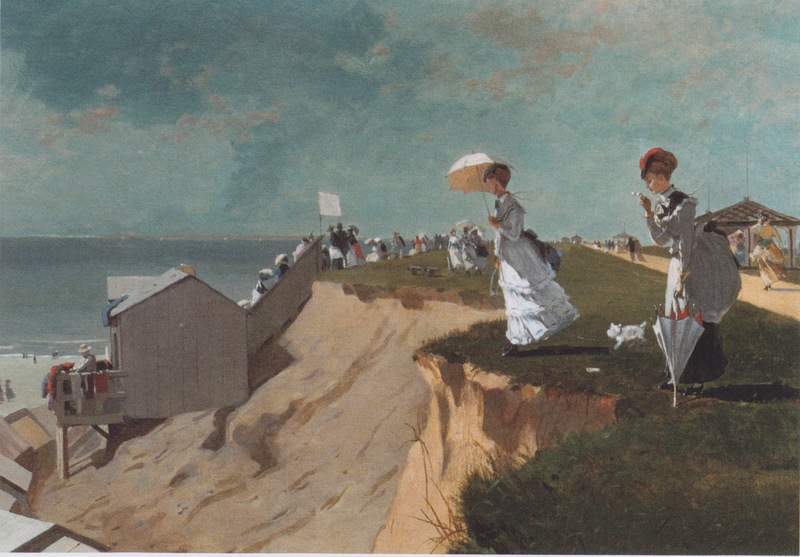 People dressed much differently for a day at the beach compared to today. This film above by American Mutoscope & Biograph Co. taken in 1903 is an afternoon panorama of weekend crowds at the north end of Ocean Beach, the western shore of San Francisco near the famed Cliff House. The film postdates the nearby Dutch Windmill (1902) and predates the burning of the Cliff House (1907). 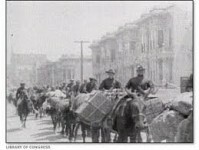 Until the 1920s much of western San Francisco was open sand dunes blown inland from Ocean Beach, the five-mile-long untamed western shore of the city. The rocky bluff north of the beach, adjacent to Point Lobos, afforded spectacular views of the Pacific Ocean, Ocean Beach, Seal Rocks, and the Marin coast. 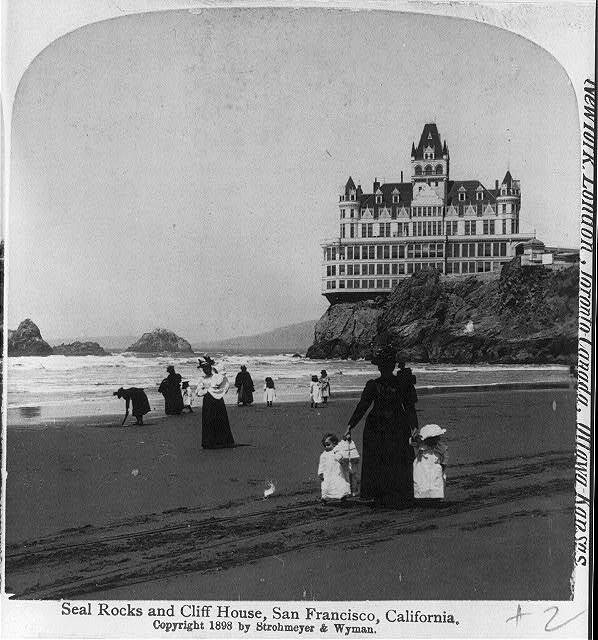 Ocean Beach began to attract visitors in the 1850s and the adjacent Seal Rock House was built in 1858. The completion of the Point Lobos toll road (now Geary Boulevard) in 1864 greatly improved access for weekend crowds. A steam railway to the area was completed in 1883, connecting the trains to the downtown cable car system. Ocean Beach Pavilion, a large concert/dance hall, was built just south of Seal Rock House in 1884. A roller coaster next to the pavilion was the predecessor of the Playland-at-the-Beach amusement park, which eventually filled much of the local beach frontage before closing in 1972. Part of the future Playland area and the sand dunes adjacent to the south was the sight of Mooneysville (1883-84), a ramshackle village erected by disenfranchised labor agitator Con Mooney and his followers. Mooney was angry at the land-grabbing tactics of the Big Four railroad barons who had built the local steam railway. The settlement was quickly removed to allow local development and improvements in the west end of Golden Gate Park, founded in 1870. The superb views from the bluff north of Ocean Beach led to the construction of the first Cliff House in 1863, linked to the beach by a road blasted out of the cliff. 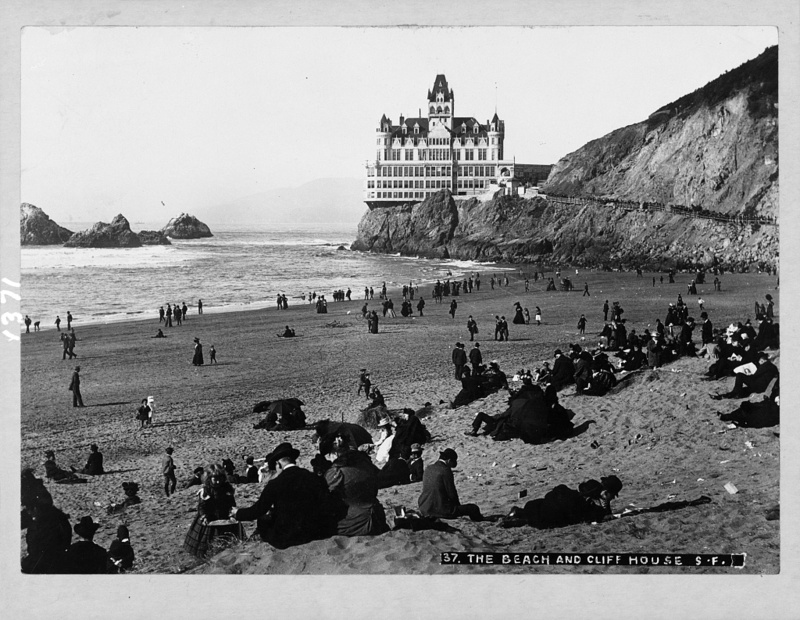 The Cliff House was a popular road house that soon became one of the sights of San Francisco. Future city mayor Adolph Sutro (1830-1898) bought the property in 1879, occupying a house on the heights above, which he surrounded with landscaped grounds. 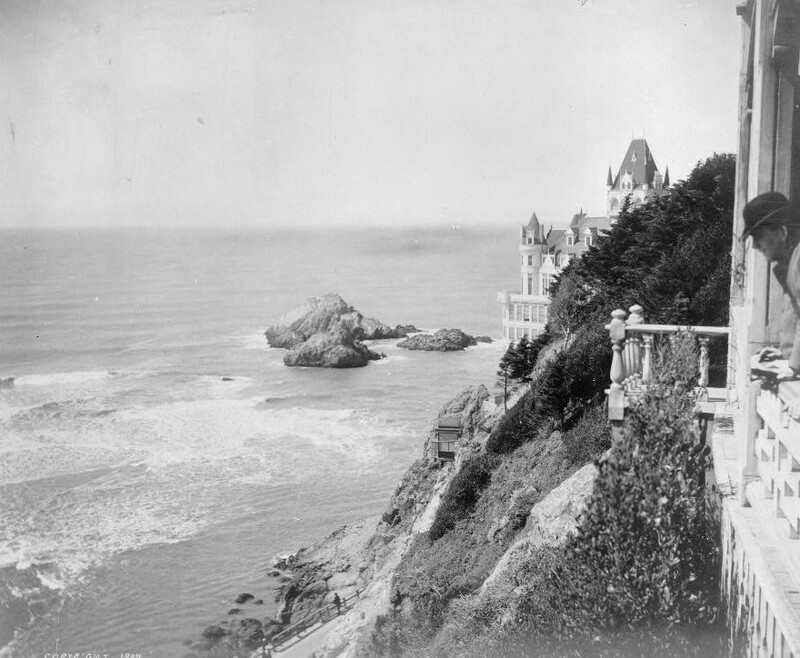 The first Cliff House burned in 1894 and Sutro built his fantastic “castle” version seen in this film and the photograph above on the site in 1896. Below is a photograph taken in 1902. 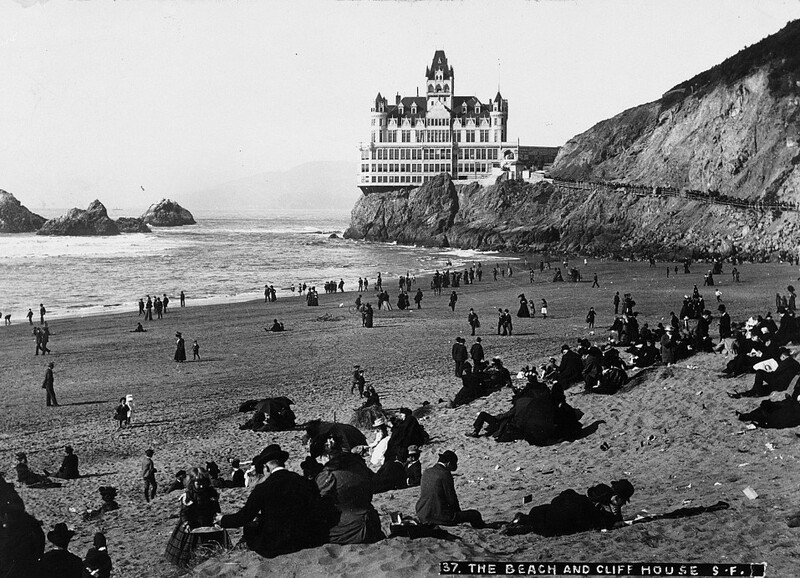 The popularity and fame of the Cliff House continued, but after the turn of the century it became somewhat disreputable and run down. The building survived the 1906 earthquake! 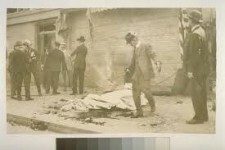 The building survived the 1906 earthquake, but burned in a dramatic fire in 1907. 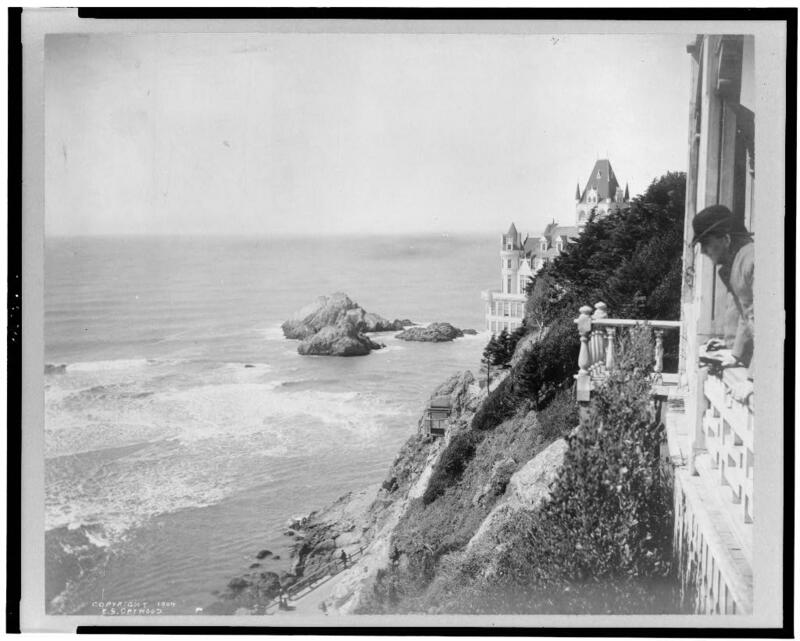 A more modest Cliff House was subsequently built on the site by Sutro’s son, but it closed in 1924 during Prohibition. In 1937, George and Leo Whitney, developers of Playland, reopened the building, which is still in use. Sutro’s former hilltop estate is now Sutro Heights Park. To the north of the Cliff House (not seen in the film) are ruins of Sutro Baths (1896-1952, burned 1966), once a popular swimming resort. Offshore are the well-known Seal Rocks, a gathering place for California sea lions. Nearby Point Lobos (Spanish for “sea wolves”) is named for them. 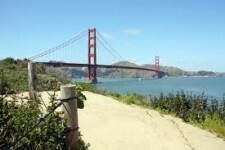 An 1877 Act of Congress granted the rocks to San Francisco, to be held “in trust for the people of the United States,” creating what was probably the nation’s first wildlife refuge. At the time of this film, the Cliff House and Ocean Beach were two of San Francisco’s most popular attractions. 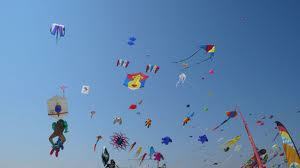 Every sunny weekend, picnicking families, young couples, and tourists crowded the beach and nearby resorts as children played in the surf. 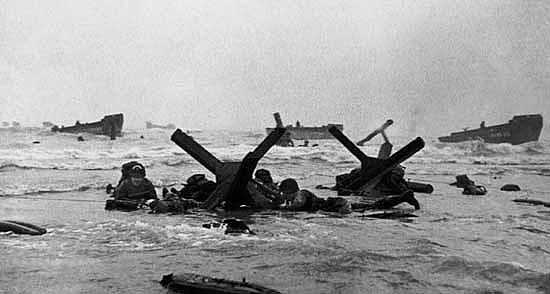 Although sea-bathing was becoming popular, the cold local Pacific Ocean waters (averaging 54 degrees F) and a strong undertow discouraged swimmers. Ocean Beach and the Cliff House remain popular today but only wet-suited surfers brave the waters to ride the offshore waves. Do you need some guidance in your tracing your family tree? Genealogy is a fun hobby that can include the whole family. One Response to A cool vintage film of a day at the beach in San Francisco in 1903 and everyone is in suits and hats!